This is a great way to cook sweet potato – it’s delicious! If you’ve got a food processor this sweet and savoury yummy meal can be ready to eat in 10 minutes. Top it with a couple of fried eggs as we’ve done here or mix in some cooked meat or bacon. Mashed avocado would be lovely on it too! Feel free to adjust the seasonings if you wish. Transfer the shredded sweet potato to a large bowl and season well with some sea salt, freshly ground black pepper, the garlic and onion powders, and dried oregano and thyme. Heat 1 tablespoon of olive oil in a large frying pan over a medium heat. When the oil is hot, add the seasoned sweet potatoes. Toss everything in the oil and stir-fry for a minute. Then pop on a lid for a few more minutes while the sweet potato cooks. The hash is ready when there’s some crunchy brown bits and the texture is soft and tender. You can plate it up with a dash of paprika and eat as is, or you can top it with a couple of sunny-side-up eggs. The addition of the eggs works really well, making this a full and well-rounded dish. Heat a tablespoon of olive oil in a frying pan over medium-low heat. When hot, crack the eggs gently into the hot pan. Season the eggs with salt and pepper, and cover with a lid for 2-3 minutes, depending on how runny you like your yolks. Once they’re done, carefully slide them out of the pan and on top of a mound of hash. Sprinkle some more paprika on top and tuck in. Meet Rhona, workaholic and super Mom! 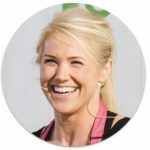 Rhona decide to get educated to help her and her kids eat live healthier lives. 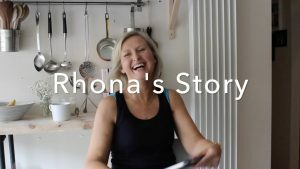 Click to watch Rhona’s Story. 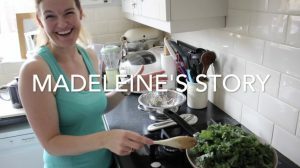 Meet Madeleine, busy Mom to 3 gorgeous boys! After years of “dieting” she finally found the right balance. 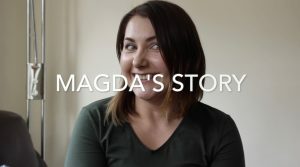 Meet Magda, aspiring food photographer and busy Mom! Magda knew there was a better, find out how Magda finally got in the best shape of her life.